50 stands of coaching UKM products under OK OCE are enlivening Ramadan Bazaar that has been ongoing since Thursday (5/24) until Friday (5/25) on the yard of North Jakarta Mayor office.
" 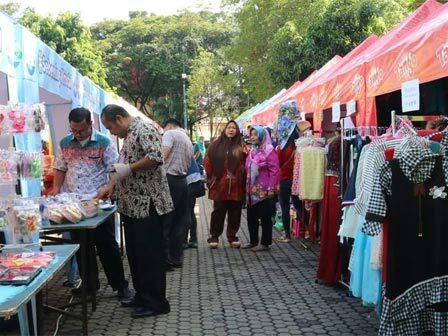 Price offered in the bazaar is cheaper than outside, surely this is helpful for the people"
North Jakarta Vice Mayor, Junaedi said, it is one form of providing facilities for UKM traders to develop their business after being trained. As for the employees and the people around the mayor's office, he furthered, this bazaar can help get the needs at affordable prices. "Price offered in the bazaar is cheaper than outside, surely this is helpful for the people," he stated, Thursday (5/24). It is very helpful for the people in an effort to meet the needs of food before Eid ul-Fitr. North Jakarta KUKMP Sub-dept. Head, Arfian explained 8,000 new entrepreneurs are targeted this year. Therefore, Bazaar Ramadan is very important in encouraging the growth of new entrepreneurs. "This bazaar facilitates OK OCE participants to introduce its superior products to the public," he stated.